Tour Description: Upon arrival at Beijing airport, be picked up by our tour guide, who will hold a sign with your name on for you to recognize. Drive to the Mutianyu Great Wall, which boasts beautiful landscape and less crowded than other Great Wall sections. Then you will be arranged to visit the Beijing old Hutong by rickshaw in Beijing downtown city. Hutong is where you can explore the real life of ordinary people in Beijing. Back to airport after the tour. End of our service. 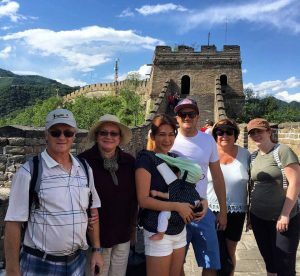 Do y’all do layover tours of the great wall at night? Sorry, no. We do not do Great Wall tours at night. There are 6 of us who are thinking about flying in for the day from Shanghai to visit the Wall and Hutong. Possibly on 2 October 2017. Can you accommodate 6 of us on tour? We can arrange this tour for you on Oct. 2, 2017. We just sent you an email, please check it out. 1.) We will make a stopover in Beijing on 17th January. Our flight arrives at 11:45am and leave at 0:50am on 18th January (13 hours layover in Beijing).We would like to see the Mutianyu Great Wall and Hutong. Do we have enough time for this? 2.) And we travelling back on 11th February. Our flight arrives at 6:25pm and leave at 2:40am on 12th February (8 hours layover in Beijing). Do you have suggestions for a layover tour? Do we have the time for anything else? According to your layover time, we will arrange the layover tour for you. We just sent an email to you, please check it out. Please provide us your arrival & departure flight times, then we will make a tour itinerary for you. Hello, I will be travelling through Beijing on March 31. My flight arrives at 14:10 and my outbound flight is later that day at midnight. What suggestions do you have for a layover tour? You arrive Beijing flight is too late. 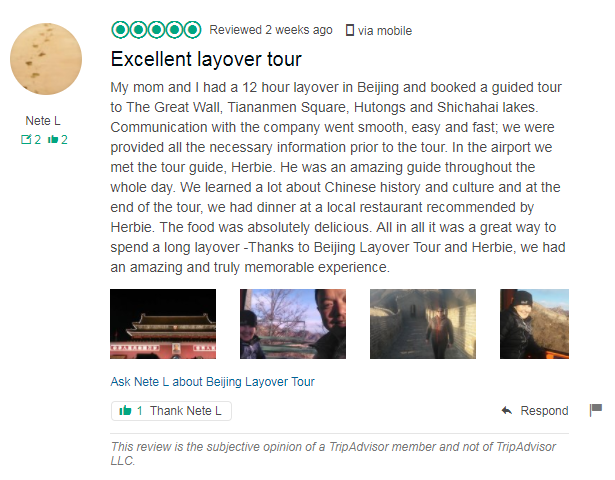 We suggest you visit Hutong and Tiananmen Square. Our travel advisor will send an email to you, please check. My wife and I have 5:00 AM – 7:00 PM layover at Beijing on June 9. We would like to see the Great Wall and Hutong. Do you have group tours? If so, how much per person? Thanks. Thank you for your message. There is no group tour available. Only private for this tour. We just sent an email to you, please check details. I am traveling alone and I have a layover. Is it possible to join a group and visit the wall? Sorry, we do not have group tours from airport so far. Our travel advisor sent you an email about your questions, please check it out.